1. 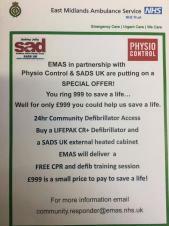 East Midlands Ambulance Service has organised a purchasing arrangement for a CPAD installation. Details are given of the poster below. 2. JHMT has negotiated a special rate for the purchase of the following external Cabinet and AED when being installed in liaison with JHMT and for installations which fall within the JHMT objectives (usually sport related with associated public access to the Defibrillator).